Celebrate the best of Canadian writing this summer with the 100-Mile Book Diet and 49th Shelf’s Read Local Map. There are so many incredible Canadian titles that it’s sometimes hard to know where to start. We wanted to provide a fun way to explore summer reading from a distinctly Canadian perspective. 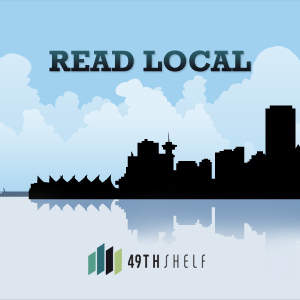 49thShelf.com is encouraging people to go local with their reading this summer, with the 100-Mile Book Diet and 49th Shelf’s Read Local Map. The interactive map (http://49thShelf.com/map) celebrates the distinctly Canadian places represented in Canadian books. From lakes to oceans, towns to cities, and all areas in between, each book highlighted is either set in a place, in the case of works of fiction, or about the place, in the case of non-fiction. Whether the summer holds an epic road trip, a day at the beach or a couple of weeks at the cottage, 49th Shelf’s Read Local Map—and its featured reading themes—will help readers find the perfect book for summer, perhaps even one set in their neck of the woods. 1. Mark the Map: Do you know of a book that is set in or about a specific place you care about—maybe right where you live? For example, if you live in Nova Scotia and love cooking, maybe you’ll add Out of Old Nova Scotia Kitchens. If you’ve walked in Vancouver’s glorious Stanley Park, maybe you’ll add Timothy Taylor’s Stanley Park. Maybe you summer in Ontario’s Muskokas and you’ve checked out the beautiful photography book Algonquin Park: Excursions with a Photographer. Add it! Eat Your Way Across Canada: It’s barbeque season! It’s corn and tomato season! If it’s about local or regional food, get it on the map. The Great Outdoors: Think hiking, canoeing, camping or patio dining. Whatever one can do in the Canadian outdoors, someone has written about it. As long as the book’s linked to a place, it’s eligible. By adding a pinpoint, members are helping other book readers discover great Canadian titles that should be added to any summer reading list. As part of the 100-Mile Book Diet, 49th Shelf is giving away a Kindle Touch 3G with a $50 Kindle Store gift card to use towards ebooks. To be entered in the giveaway, participants must pin a book on the Read Local map. 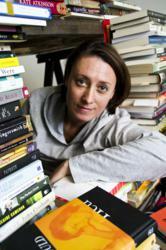 Think of 49th Shelf as an interactive, intimate virtual library stocked with Canadian books by authors both world-renowned and up-and-coming, writing in every genre. But not just a library: 49th Shelf is also a community of avid readers who share the books on the site by making reading lists and book recommendations. On 49th Shelf, you’ll find books you’ll never forget, meet people whose lists and reviews you’ll admire, and learn more about the authors who intrigue you. 49th Shelf is produced by the Association of Canadian Publishers in association with the Canadian Publishers’ Council with funding from the Department of Canadian Heritage and the Ontario Media Development Corporation and a lead sponsorship from Amazon.ca.